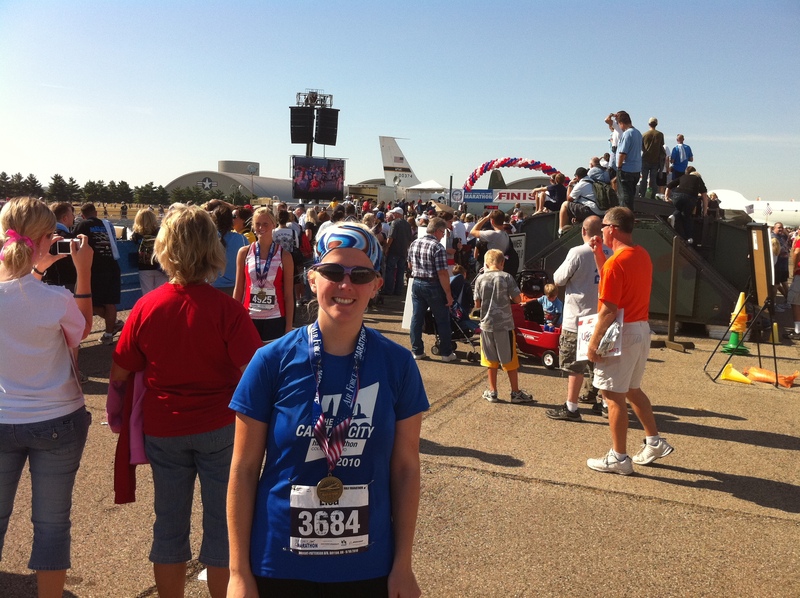 Air Force Half Marathon September 2010 - One year after being diagnosed with MS. This entry was posted in Multiple Sclerosis, Running and tagged Marathon, MS, Multiple Sclerosis, Running. Bookmark the permalink. I was diagnosed after I fell at mile 21 in the Chicago Marathon. I was experiencing foot drop and my left foot didn’t lift. Anyway I had a pair of 2:38marathons and I was really struggling in this one. My legs didn’t want to lift. I saw my wife at 24 miles and seeing how it was a bad day and I was about to run my slowest time, I dropped out. In hindsight I could have finished ( and I wish I did) but I had finished many others and I didn’t run to finish. After many misdiagnoses MS was diagnosed. So I wish you the best for as long as you can do it. I stayed in the closet for many years after I was diagnosed so you’ve got me beat there.. Thank you for sharing your story. Its nice to hear about other runners with MS. Are you still running? Thank you for your comment! I have quite a bit of numbness on my left side. Have you found out anything that seems to help it? The only thing that “appears” to help me is to rest but not a huge fan of that. 🙂 What marathon are you planning on running? Let me know how the training is going! When I experience numbness, rest is the only thing I’ve found to help. Like yourself, I like to stay busy, versus resting. I work very hard to minimize stress in my life. In October I’m going to run Whistle Stop in Ashland, WI. In two week two of my friends are flying to San Diego to run the Rock & Roll Marathon. Both of them are attempting to qualify for Boston, and I know they will do it. One of them is my trainer, and seeing his dedication to his own goals has helped me continue to work hard on my own. As you know, MS can be a rollercoaster of emotions. I DO see the humor in so many things, and each time I’m down, it’s humor that lifts me back up. Being around all types of runner I found on missing piece for me. Someone else who has MS. I feel blessed to found your story, and folllow along with you. From the bottom of my heart, thank you!!! You inspire all of us.